First of all, these are a FAR cry from what I would consider to be a real enchilada--you know, drenched in enchilada sauce and greasy cheese, steaming hot, melty...the ultimate comfort food. These are more of a...black bean roll-up type thing. 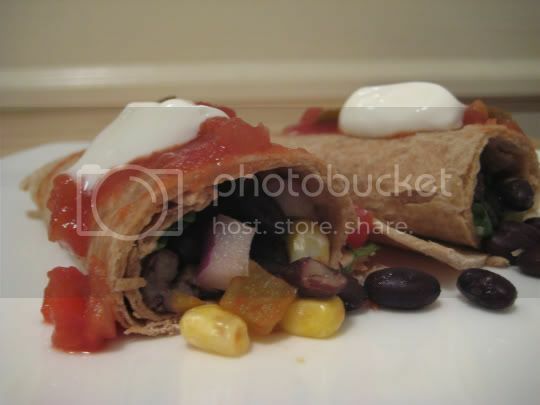 Very similar to the flautas I made some time ago. So although I knew I wasn't getting myself ready to gorge on true Mexican food, these were satisfying and filling, in a light, healthy way. These were also extremely easy to make, by just mixing together a can of beans, corn, red onion (this added a delicious sweetness and crunch), and prepared salsa (instead of sprinkling the finished product with chopped cilantro as the recipe suggests, I added it into the bean mixture); rolling it up in tortillas (whole wheat, of course); microwaving them; and topping them with more salsa (plus some sour cream for my pleasure). I was done and ready to eat in probably less than 10 minutes. Make again? Yes, maybe add some cheese next time (who am I kidding...these are NOT enchiladas).